We bought a fridge. Our second official “adult” purchase. A washer & dryer was the first when we moved to San Antonio. Something feels very satisfying with spending over $2000 on such a magnificent household item. Think about it, a fridge is the glue of each kitchen. We direct guests to it for ice (or beer 😉 ), we need it to hold a birthday cake, we plan out what dishes will fit while prepping a holiday meal … of course the most important: it has to fit into our daily lives. We’ve had such a headache in this rental and its horrendous fridge. After doing a few months of research we’ve been educated as to why this fridge is so small. It’s a counter depth fridge which is actually considered a custom order! WHAT?! A smaller fridge is custom? You got that right, a custom order to the tune of $500-900 MORE than a “normal” fridge! It was a huge relief because then I knew that no matter what fridge we’d purchase, it would fit everything comfortably without having to create a Tetris pattern of jars and yogurt containers. We splurged a bit because my parents helped out with the fridge as our 1 year anniversary gift. We’re very thankful and appreciative for that lovely gift. 29 cu. 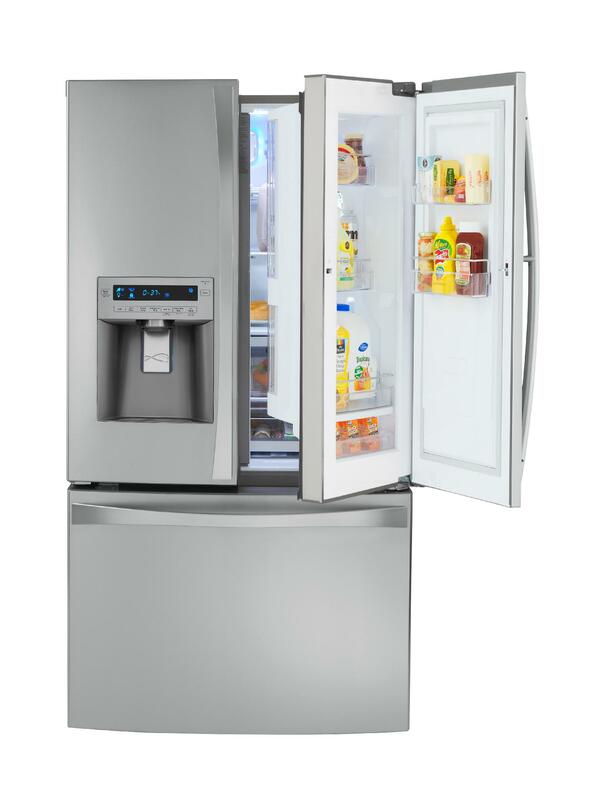 ft. of sleek stainless steel, LED lights, a grab-n-go door, plus the almighty “beer drawer” … don’t forget about the freezer, the door tilts open so THREE slide out bins have easy access (it can hold a pizza!!). Come to mama! The only downside: my magnet collection will be limited to a small square on the left side which can be seen between the counter and cabinet. This just means I need to hurry up and find a garage fridge (you know, the standard top/bottom fridge/freezer, no ice maker … primarily needed for alcohol and meat … and magnets!). So why the long rant about my new fridge? Because this means I can plan MONTHLY menus instead of WEEKLY menus … I shop weekly since that’s all the fridge in our rental can hold. The freezer doesn’t work very well so I’m scared to buy meat in bulk and freeze it for a later date. We have to eat everything before going on another grocery trip. I know, it sounds like a minor world problem but it causes me to be stressed with going to the store every Monday and if my schedule changes last minute: well then, we’re out of dinner for 2 days until I have another “free” day to head to the store. Plus we don’t have room for leftovers, 2 extra containers throws off my entire OCD Tetris set up. 2 more weeks and we’ll be in our new house. Movers come on the 23rd! Let me just say that your new fridge is BEAUTIFUL!!! It’s funny how life changes what we truly want and appreciate!!! It will look pretty awesome in your new house!! !